small steel mold, Bamboo rubber board, wooden side, etc. must be placed into the designated venue according to the specification, and should be placed neatly, the height of the formwork is not more than 1.5m. When the small steel mold is removed, it must be removed from top to bottom and transferred at the same time. It is forbidden to remove the formwork of the entire wall at the same time. It is strictly forbidden to throw the removed formwork. When the roof formwork is removed, it should be removed gradually from the doorway. When the keel and formwork are removed, the operator must stand in a safe place to prevent accidents. Remove the bamboo glue board and the raft to remove the nails in time to prevent the ties. The formwork panels should be marked with a special stacking area. The large formwork in the field should be stacked according to the specifications and models, and clear signs should be set up. Non-operators should not enter the form stacking yard at will, and should not rest and enjoy the cold under the large formwork. The large formwork should be piled up within the effective radius of gyration of the tower crane. The stacking site should be solid and smooth, the drainage should be smooth, and no water should be accumulated. 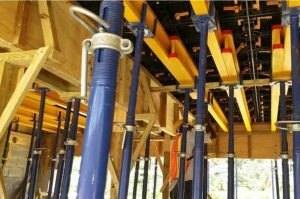 When the large formwork is installed, the wires and gas welding lines must not be pressed underneath. When the large formwork is stored, the self-stabilizing angle should be adjusted at any time. Face-to-face placement should prevent dumping: the inclination of the board should be 75°~80°, and the legs should be provided with long mats. The two panels should be left for easy cleaning and painting. The channel for the agent operation (the bottom distance of the plate is 50~100cm). Angle molds and other supporting formworks should be placed on a dedicated stacking rack, or stacked on a flat surface. It is strictly prohibited to place on a large formwork or other components to prevent the person from falling down and injuring people. Before lifting the large formwork, adjust the position of the crane properly, and check the rope for lifting. 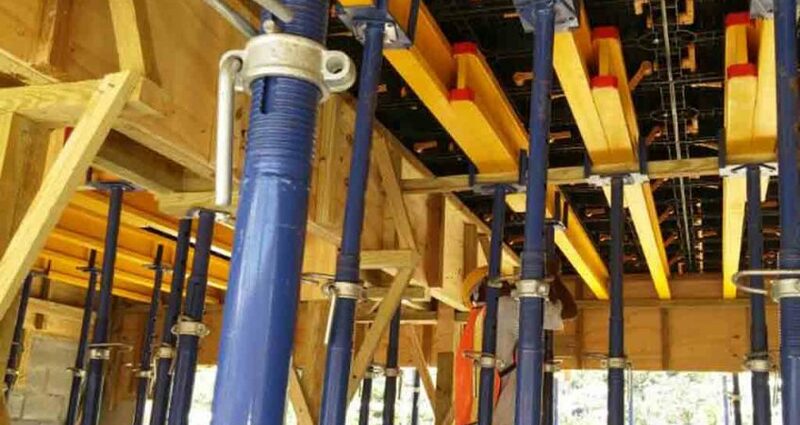 The clamp and the lifting ring on each formwork are firm and reliable, then hang the hook, remove all temporary leather support, and stabilize Stable lifting; it is forbidden to remove the large formwork without hooking: It is strictly forbidden to use human to move the template. During the lifting process, the template is strictly prevented from swinging or knocking down other templates. Crane drivers and command signal workers must be trained and certified to work. In the construction, the commander and the driver must unify the signal, prohibiting illegal command and operation.